There are cafes and kiosks in Singapore which pull all stops to stay in the game. As the modern consumer gets short attention spans, trends come and out faster than before. Some used-to-be-hot items get forgotten in a few months, or even shorter. Hvala Waffle Bar is one kiosk that keeps on going. They introduce new products on a regular basis, invite prominent food instagrammers to try and review, and have gotten some traction in this competition market. I am divided on this. On one hand, I am proud of their determination and their passion is obvious. 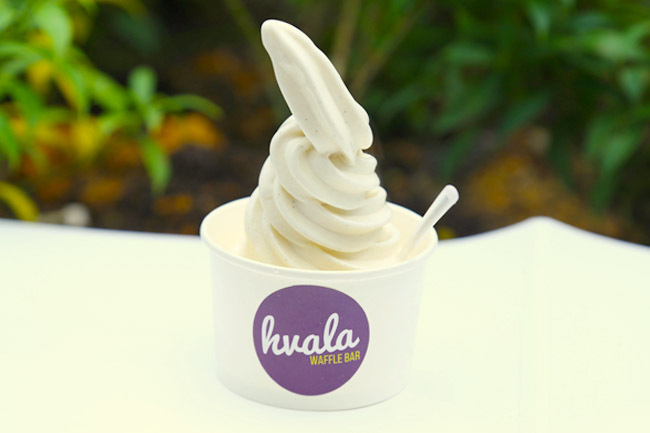 On the other, I am not quite sure about their newest offering though – The Puffle ($7.90), which is a cup of vanilla bean soft serve topped with EGGLETs, and other toppings such as fruits, museli and sauces. People in the know that this is a copy of Hong Kong’s popular Oddies Foodies, with gai dan jaai stuck in softserve, presented in an over-the-top fashion. It WILL attract enough people to “Let’s go and try….” and “This will look good on my instagram feed.” but I really wonder how long this whole ‘game’ will last. I know I was the one who DID suggest that, a few months back in this blog entry – in the concluding line. Perhaps they can think of what is truly iconic to ourselves and their brand, and spin something off from there instead? Had the Puffle with premium soft serve and 2 toppings ($7.90), and I did like the texture of the ‘egglet’ – crisp, buttery soft, and goes well with the sauces. The weaker link I thought was the softserve, which I thought was still too sweet, especially when it would be drizzled with sauces. Recommendation: Do share the sweetness and calories. Puffle egglets in a soft serve. SO MANY people looking at me as I was taking photos of this. One went "Isn't that @danielfooddiary ?" Yah lor, some more I wear very 'lock' today. 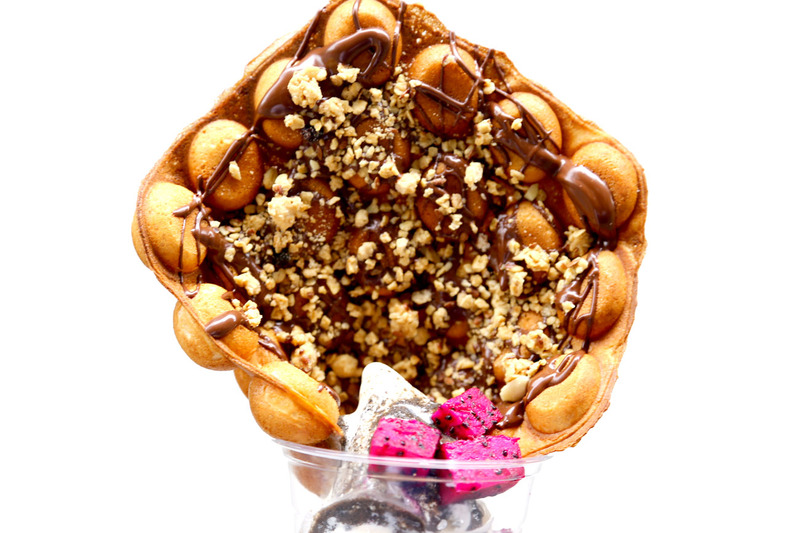 [Original Entry] The waffle fever has not stopped yet, with cafes coming out with creative options to outwin, outplay, outlast. 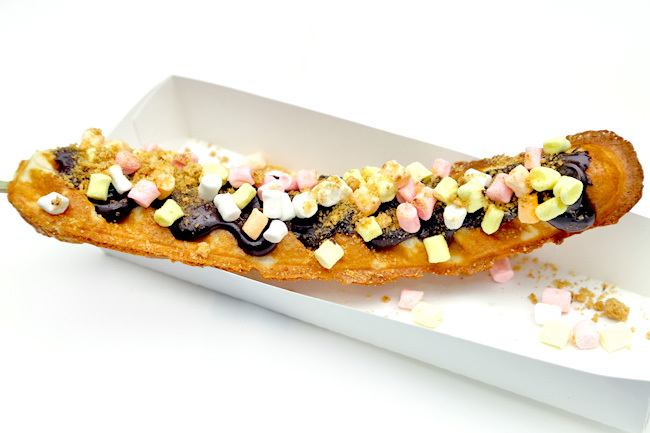 Next in line is a waffle stick bar, with portion meant for one person. 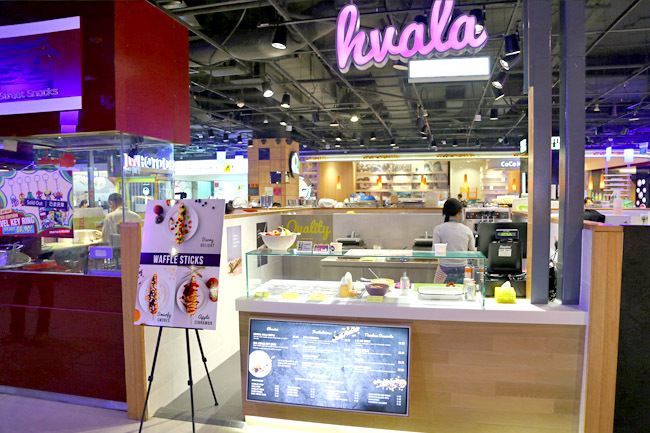 Hvala Waffle Bar is entering the very competitive market with a kiosk at 313 @ Somerset basement, selling waffle sticks and vanilla soft serve. This, bearing in mind powerhouses llao llao and Honey Creme are somewhere around, and both with diminishing queues. Good idea though. I can never quite finish those whole thick waffles sold in cafes, despite sharing. 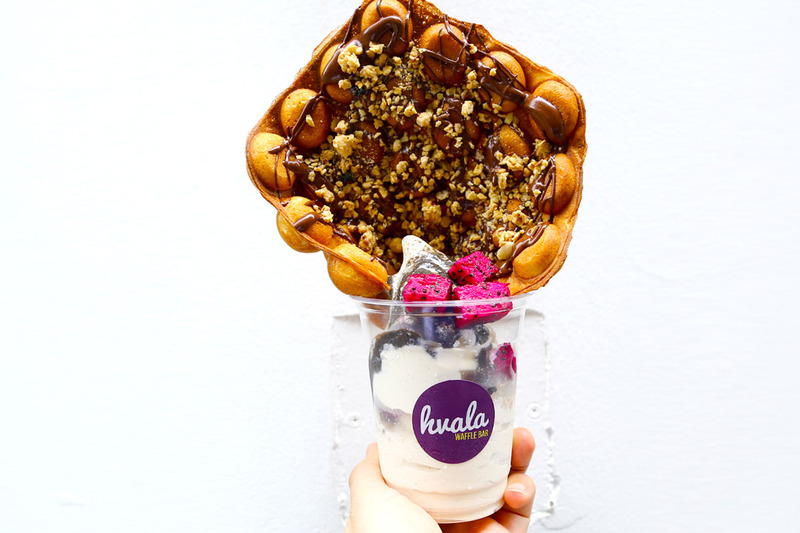 The Original Hvala Waffle ($3.00) is served with maple syrup, icing sugar and cocoa power, where you can opt for more fanciful flavours such as Apple Cinnamon ($3.50), Bella Banana ($3.80), Crème Brulee ($3.50), Tiramisu ($3.80) and Berries Delight ($3.80). 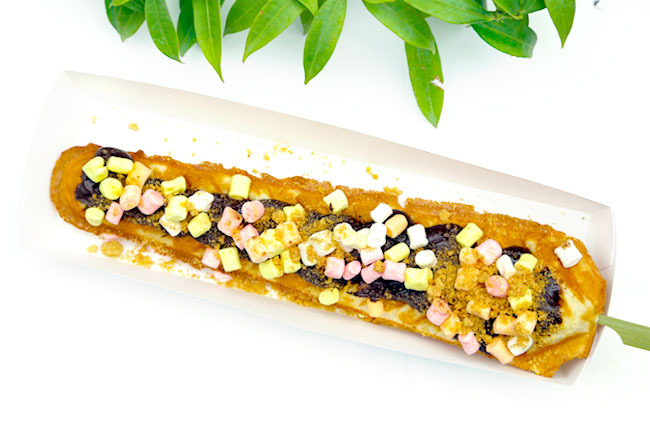 I was recommended the Smurfy S’mores ($3.80), with the waffle stick brushed with melted chocolate, topped with graham crumbs and marshmallows – flame-torched at its last process. Hey, prices are quite friendly. All these for $3.80 at a kiosk in Orchard. I hope they have worked out their sums. The inner batter was the soft chewy type, reminding me of those old-school waffles sold at the confectioneries. Outer layer could be crisper. It could be an age or health thing, but I found the stick way past my sugar-tolerance level. The culprit was most likely the chocolate, AND Vanilla Soft Serve (additional $2.50). Hvala Waffle Bar serves their waffle as a stick or cut up into pieces. Eating can be cumbersome. 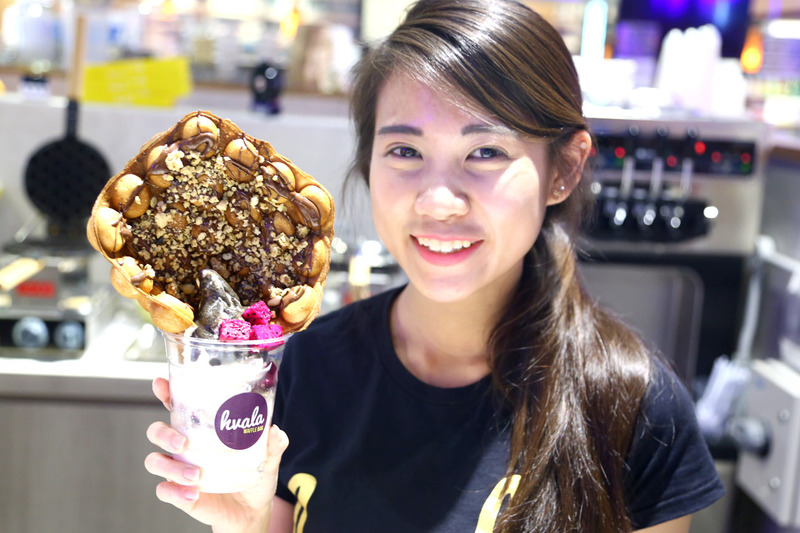 Perhaps they can find a way to incorporate the waffle and soft serve in a single cup somewhat like Oddies Foodies in Hong Kong. ← Selfie Coffee Singapore – Serious. Drink Your Selfie!